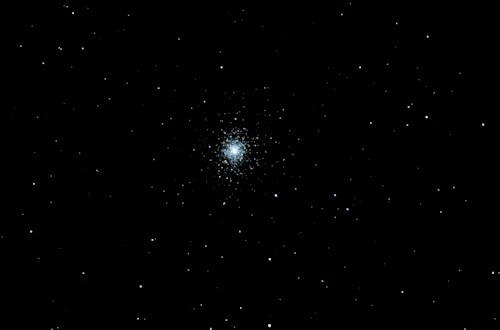 This website is a collection of night sky images I have taken. 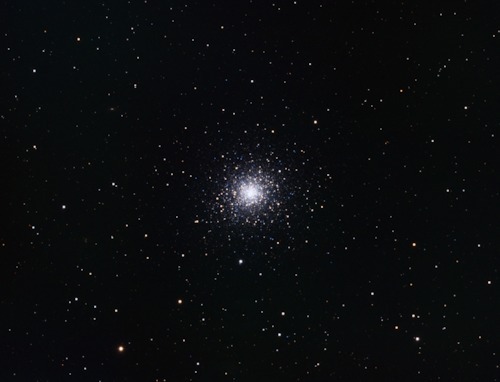 The collection includes images of stars, clusters, galaxies and nebulas. Most of images were shot from my backyard or from one of the many dark sky locations found in Alberta. 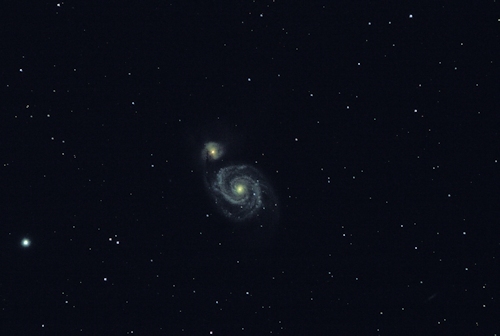 This galaxy image for example, was taken near Elk Island National Park. I have found that observing and taking pictures of the night sky to be quite interesting and rewarding. 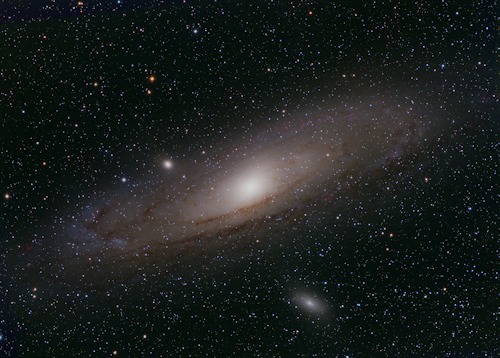 All of the images on this site were taken with digital cameras attached to computer controlled telescopes. Almost all are made up of many raw frames that are stacked together using astronomical image processing software. One or two are from raw single frames with minimal processing. The camera currently being used is an SBIG STF-8300M. It is a monochrome CCD camera with an 8 position filter wheel. The filter wheel has red, green and blue filters for gathering color data. There is also an L filter which is a clear IR/UV cutoff filter for gathering luminence data. The remaining filters are Ha, OIII and SII which are narrowband filters used for nebulas and other deep sky objects with specific emission characteristics. In the past I have used a few different full color CCD and DSLR cameras so a number of images on the site were made with them. Moving forward I expect to stay with monochrome imaging using filters. So far that has proven to deliver the best results, even from a light polluted city. The telescopes used for the images on this site include the CFF 132 in the above picture as well as several other imaging telescopes. 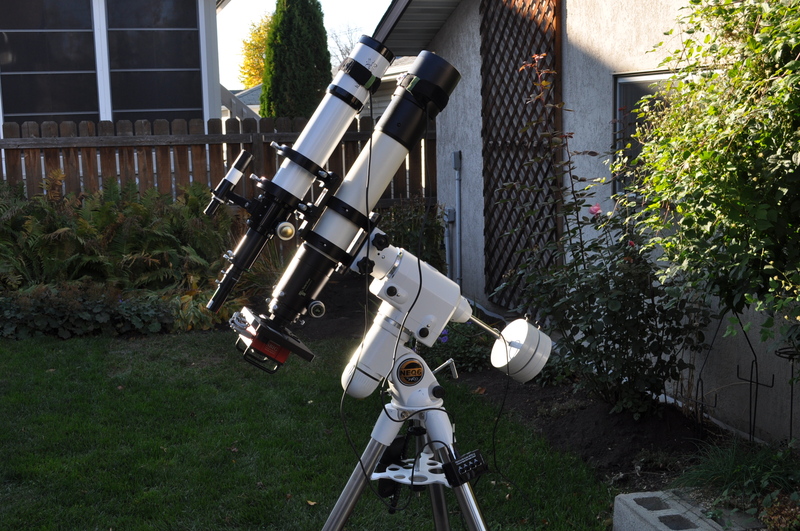 The other scopes used on this site include a Celestron C8, a Celestron 11 inch EdgeHD, a Tele Vue NP101is refractor and a Sky-Watcher MN190 Maksutov-Newtonian reflector. My current primary imaging mount is the 10Micron HPS GM1000 shown above. I also have an NEQ6 seen below which I now mostly use for visual observing and equipment testing. In the past I've had an EQ8 and also a CG5. All of these mounts have been used for images found on this site. All long exposure images are now being done using an autoguider. 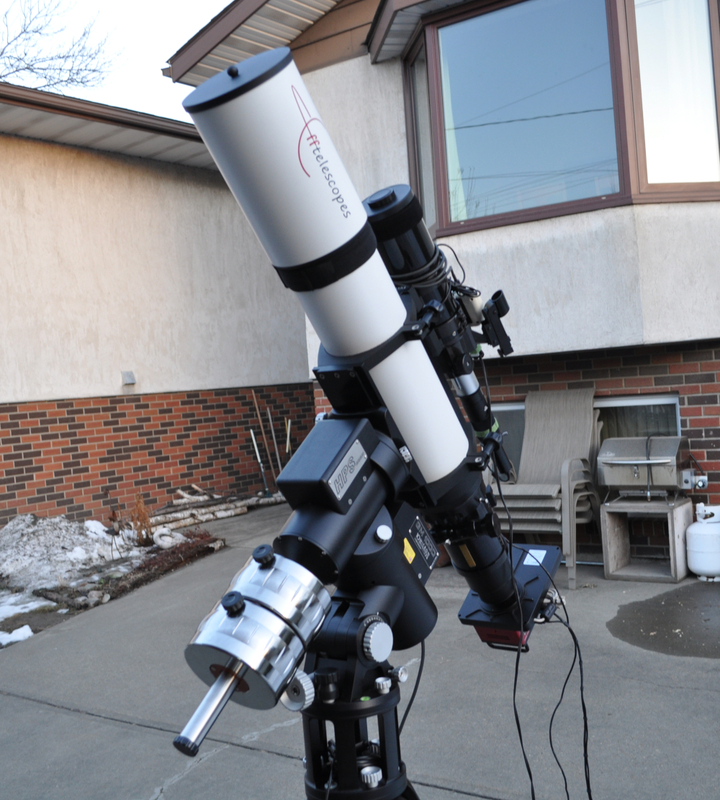 The current autoguiding setup is a LodeStar X2 camera fitted it to a Lunt LE80OTA with a modified GSO 2X barlow lens. I also have a Celestron Off-Axis Guider for use with the SCT and some other 80mm refractors as well as a couple of spare cameras. So there are a few ways the guiding has been done. Some short exposures taken with the C8 were unguided. In any event, for now I am once again back to using the Lunt LE80OTA as a guide scope. The Vixen used on lots of the images here worked very well indeed. But it was sort of long and heavy so after trying a few variations on the ST80 I ended up using the Lunt again. The little Lunt has proven to be a fairly good quality ED doublet. And even when used with a barlow, it still produces nice, bright and round stars that PHD can easily guide on. Most of the images shown here are composite stacks made from a number of individual photographs. Depending on the conditions, individual exposures vary from less than 30 seconds up to several minutes. The stack can be any number of these exposures. Once the individual frames are collected, software is used to stack the frames together to form a composite image. Final processing is usually done with photo editing software for brightness and contrast adjustments as well as cropping and resizing. Worst picture on the site? As for image quality, if you go through the site you may find some pictures that are pretty poor quality indeed. I am well aware of that and decided to leave them up anyway. Some of the photos are like that because they were test images or specifically done to illustrate an astronomical object rather than to be a pretty picture. Other images are pretty bad because they were done long ago while I was still in the early stages of learning astrophotography. Or there may have been problems in data collection or processing. But these lesser images will probably stay up for a long time yet. In several cases they show the progression from beginner to where ever I am currently. In other cases they show one time events and there is no way to go back and re-take them. Comets and supernova come to mind here. Total exposure times can vary greatly. Stars and other bright objects like planets are usually done with short exposures. Galaxies, nebula and other faint images can take many hours of total integration time time to form a good image. Actual time spent gathering image data depends on many things including luck and weather. There is a difference worth nothing about exposures and total integration time. Exposure time refers to the exposure time for an individual frame. Integration time refers to the total time for all the frames used to build an image. This difference causes a common mis-conception, that being the myth that ultra long individual exposures are needed to reveal dim objects. In fact, most objects on this site would show up in photographs taking only a few minutes to expose. Exposing a single frame for more than a few minutes often doesn't work anyway because the bright parts saturate (ie: get overexposed) and the dim stuff is still more or less invisible. But going too short has problems too since you need to keep the shutter open long enough to at least detect the dim stuff. And individual frames are also are subject to random things like atmospheric seeing conditions, tracking problems and varying amounts of background light. So most of the time, just one frame, be it long or short, makes for a rather poor image. To get around these limitations, one method is to take large numbers of frames and stack them. To do this, first expose the frames long enough to detect the dim stuff, but short enough to not oversaturate the bright things. Then by using stacking software, find the average of each pixel value based on data from all the frames and use that data to make the final image. The end result is a much more accurate photograph that is derived from many hours of observation instead of one from just a few minutes off a single frame. Now, there is a lot more to integration than just averaging pixels. First, straight up averaging is an oversimplification. But weighted averages with bad pixel rejection is a good start. Then add in some clever bits of statistical analysis and it it becomes possible to very accurately determine the pixel value in each position, given enough raw frames to work from that is. And that's just the beginning. Among other things, the images need to be very precisely aligned and calibrated. Then they usually get digitally filtered, stretched and otherwise made presentable. There's more too, but the main point is that it usually takes the integration of many short exposure frames into a single long exposure photo to get a picture that is worth looking at. The major software packages currently used for these images include Sequence Generator Pro, MaximDL IP and Gimp. Sequence Generator (SGP) is used to control the camera and gather the images. MaximDL is used for stacking, filtering and stretching the images. Gimp is a general purpose graphics package used here for final processing, cropping, resizing and format conversions. Besides these major packages, there are also a few more utilities and drivers. In fact, the dedicated astronomy laptop I put together a few years ago is now getting kind of full with various utilities and other packages. Most notably, PHD is used for running the auto-guider and Starry Night Pro is my planetarium package. And there are also very helpful utilties like ModelCreator, MountWizzard and the 10Micron tools for automating the sky modelling and controlling and updating the 10Micron mount. EQMOD is often used for connecting to and controlling the Sky-Watcher mounts. Besides all these, there are various drivers for things like the Rigel and Optec focusers, MBox weather station and other ASCOM related gear. Publishing is done manually through the file management option on the website control interface. I can also use an FTP client if I like but so far the web interface works well enough. The site is hosted by SaveOnHosting, a very good hosting company for sites like this. They are located in Calgary, Alberta. The site uses a Windows server platform and runs in the Microsoft ASP.NET framework. The live server delivering site content on the public internet is owned and operated by the hosting company. The source code for the site is developed and tested on an Asus laptop running Windows Home Edition located in my basement. I am the sole author of the site and it is currently the only website I work on anymore. All mistakes are mine and mine alone. Including speling errors and the grammer too.